Love this gorgeous card Joanne, love those stamps and the netting they certainly put you in mind of beach combing. This is fab, Joanne. Love the shells on the netting - I didn't realise it was die cut, I thought you've saved it in your "might come in useful one day' box.....I can't be the only one who has one of those! What a gorgeous beach card! The netting die cut is great. 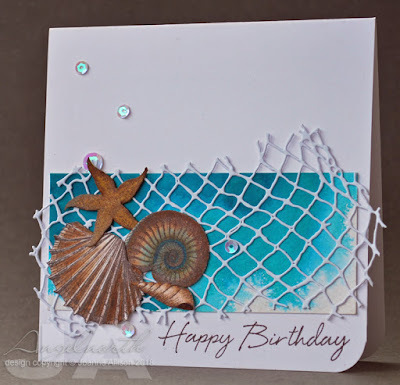 Wonderful card that makes me want to go stick my feet into the water and seek some shells while I'm there. Love the netting die - I just got one for myself but have not yet used it.